Devoid Of Culture And Indifferent To The Arts: Recipe: Who knew the nectar of the Gods was coloured red? Recipe: Who knew the nectar of the Gods was coloured red? Many years ago I experienced the elixir of the Gods. Well, not quite, but close. 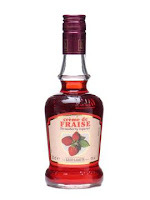 Our local liquor stores had marked down a product they were discontinuing: Lejay-Lagoute Crème de Fraise (Strawberry) Liqueur. It came in a beautiful crock bottle, sealed with red wax and encased in a wooden box. The image at left is their current packaging. What taste. Some liqueurs have a hearty dose of alcoholic afterburn, but not this. 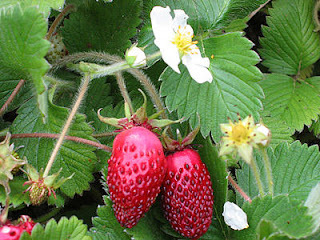 Picture a mouthful of wild strawberries. Now you have the experience. Well it was a sad day when they finally sold off all their stock (mostly to me I imagine), and I missed it terribly. You can ask the liquor store to import for you, but you have to purchase a minimum of one case. I finally found one that comes close. You have to have the ripest, flavoursome berries you can find. That's usually a little while after the start of the season, although I have found imported berries in the fall/winter that have worked quite well. Some day I'll round up enough wild strawberries to try it. Then I hope it will be perfect. 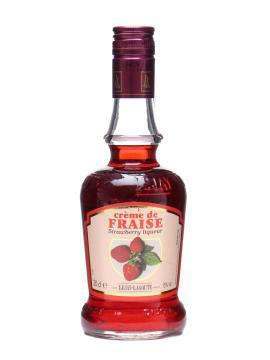 This liqueur is extremely easy to make. The problem is that it disappears so quickly. That's OK, because I wouldn't recommend having any homemade liqueur hang around for more than 6 months. No worries about that. Wash, hull and slice the berries. Place in a non-reactive bowl, such as glass or ceramic. Heat the sugar and water until the sugar dissolves. Let boil for 1 minute. Pour the syrup over the berries and mash. Cover with plastic wrap and refrigerate for 1 week. After 1 week strain and discard the pulp. You should have about the same volume of liquid as you do vodka. Combine with the vodka, strain again, bottle and let sit for 1 week before use. Take care. It has a kick. Serve in champagne or martinis, or just by itself on the rocks. Note: Sometimes after a while a cloudy sediment develops. No worries. It's only because the first two strainings didn't get all the fine berry pulp out. Simply re-strain, wash the bottle and pour the liqueur back in. * Luksusowa is available at Bishop's Cellar on the waterfront. It has a less harsh taste than grain-based vodka, and costs the same or less than many other vodkas. If you like this post, retweet it using the link above, or share it using any of the links below. I had a peppered strawberry champagne cocktail at a restaurant and tried to find it online, but couldn't. I then found out that the restaurant made it in house, so I did too. My recipe was very similar. Adding a little bit of black pepper was fantastic and cut the uber-sweet strawberry taste really nicely.